If you’re feeling left out of the fiber festing, Kristi has some great links that will allow you to vicariously “attend” a few festivals. And now, back to random vacation pictures! Posted by Chris on Sunday, June 17th, 2007, at 11:15 am, and filed under Festing, See the Sights. Is that the only spot that’s tidy, May? Be careful or Mum might bring home a woolly sister or brother, that’s bigger than you! Gee, I didn’t know that Mayhem liked to read knitting (k)novels! That book is a ruse – she really listen to it on e-books doesn’t she? Exactly how does one “lung”? Great pics! 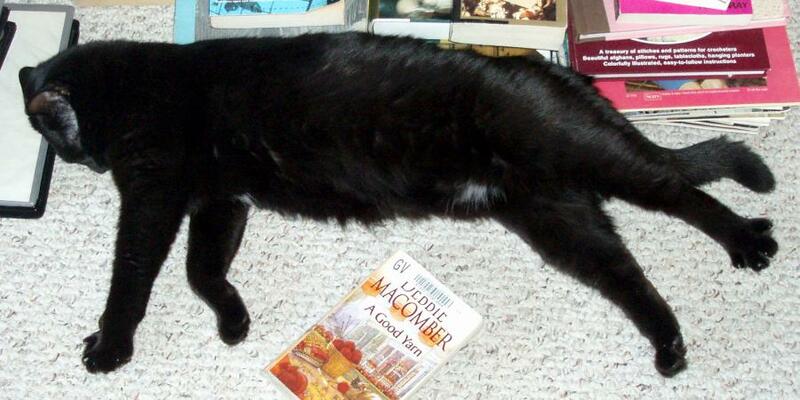 It’s good to see May is catching up on her reading while you’re gone. So is the “No lunging” sign for the people or the llamas? I wish we had fiber festivals closer to me that I could attend…the closest I will get to one is the state fair in august. 🙁 They don’t usually sell fiber there though. What llama activities would cause death? Getting kicked in the head? Looks like you are having a good time. Stash enhancement! Flash your new stash! 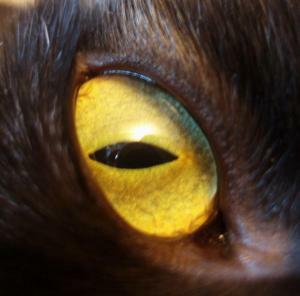 Hmmm – Chaos is noteably absent from the homefront photos – me thinks he’s up to something! What a hysterical llama sign – Injury by Llama – a book title for sure! So May’s been reading the knit novels? 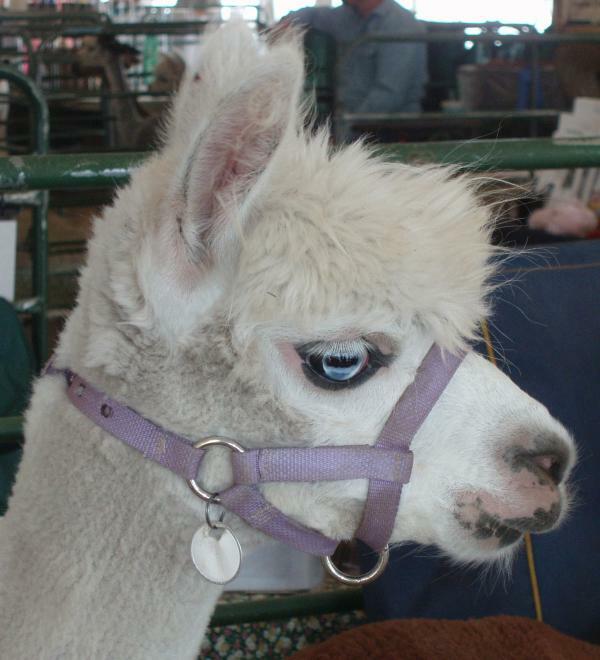 Weird blue eyes on that alpaca! And what’s ‘lunging’? Haha. Love that Llama warning sign! You didn’t lunge, did you? Lisa, “lunging” is a method of warming up a horse by putting them on a very long lead line (lunge/longe line) and running them around in circles. I really like the blue-eyed llama—did not know they could have blue eyes—and the red cat… are they plates? Cute, anyway! 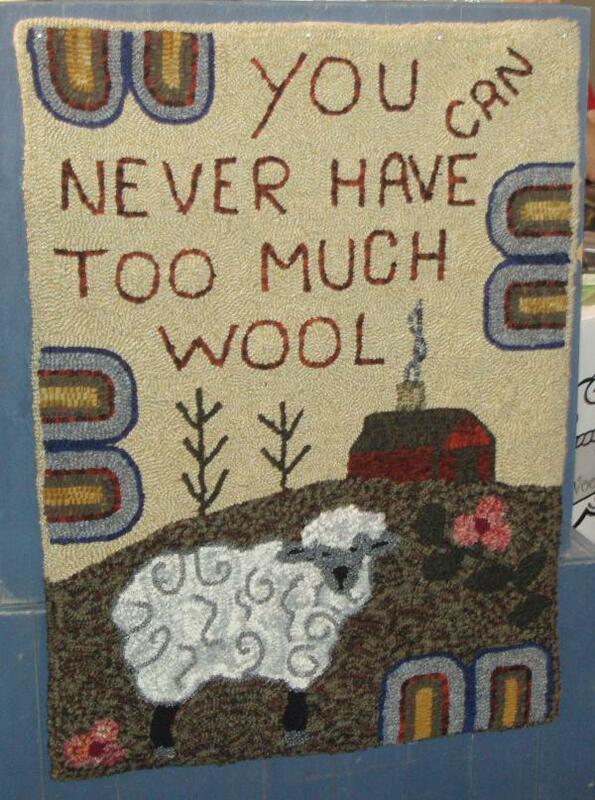 Love the wool sign. Sorry… didn’t quite finish. That’s an alpaca. Yup. Ooops. Cute. And with the lunging, there is a human attached to the other end of the lunge line, standing dizzily in the middle watching the horse fly around him or her. Oh my gosh, I am so captivated by those blue blue eyes. 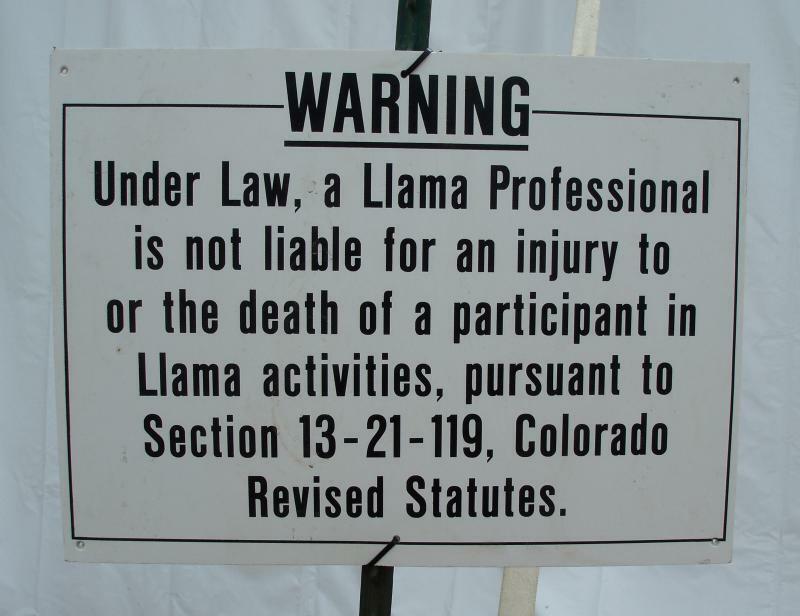 And I have to wonder what event precipitated the law protecting “llama professionals” regarding those dangerous “llama events”. Hee. Great pics…and looks like you had a great vacation. 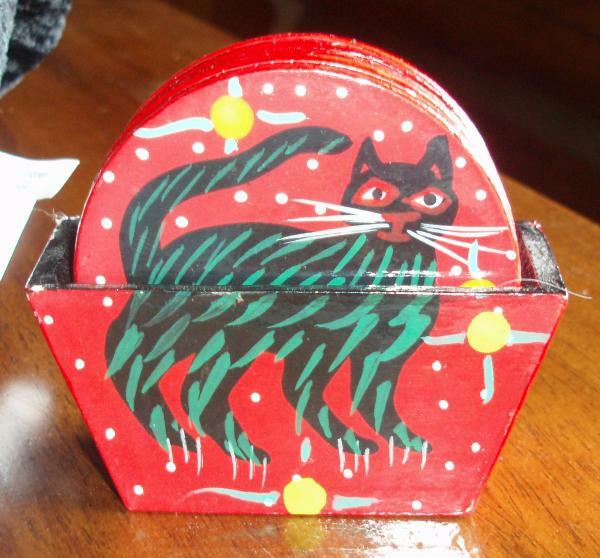 Ok. So…you bought both the hooked rug and the black cat – what IS that anyway, coasters? – right??? You’re showing off some of your booty? 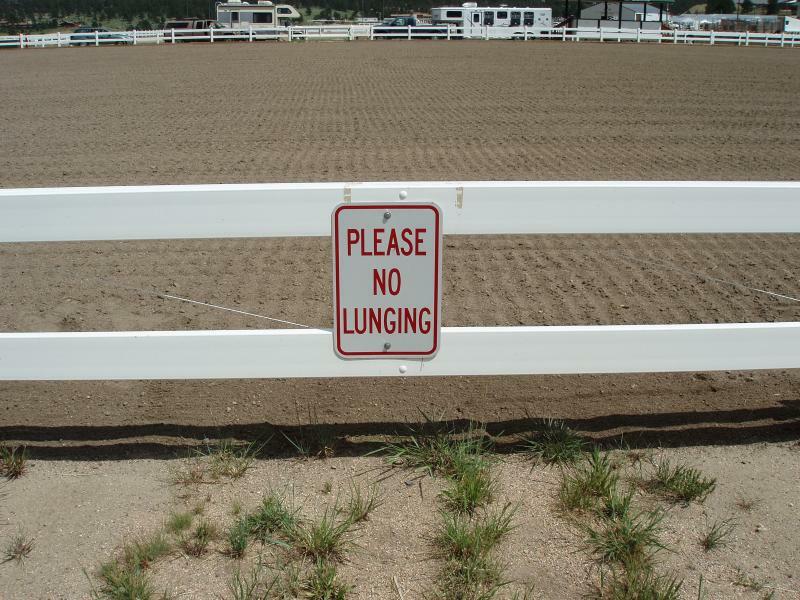 OH that shot of “Please No Lunging” ROFLOL! Hope you continue to have a wonderful trip! 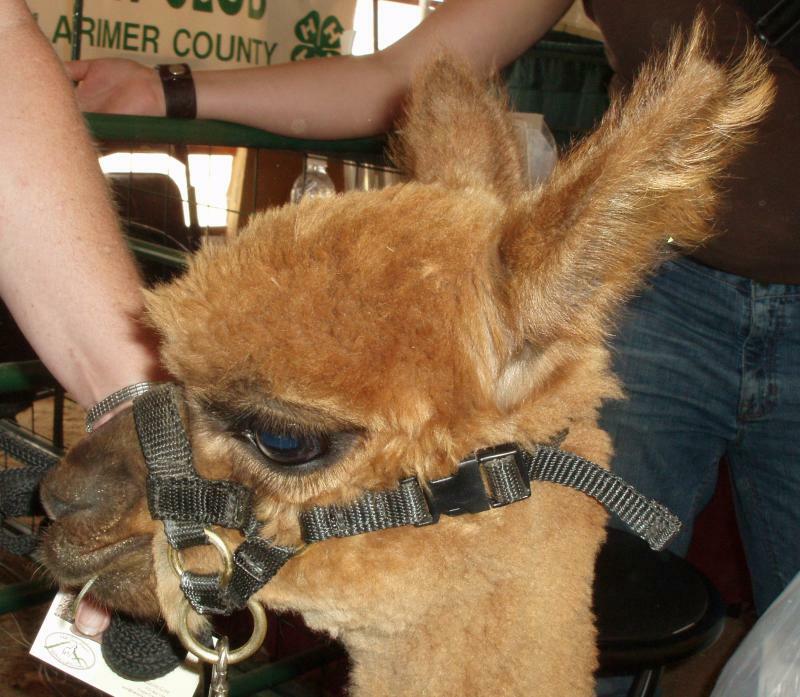 (you have bought plenty of llama & alpaca fiber, right? I love the sign! LMAO! Chris- Imagine the obit in the paper. DEATH BY LLAMA! Great vacation pics, enjoy yourself. Seems like Mayhem has the same taste in books as we do. I hope the kitties ARE holding down the fort and not tearing it to pieces! It was so wonderful to meet you and spend time together. Thank you for the bag of goodies, too! I have LOVED the CD! Let’s hangout again soon! Thank you for sharing your experiences with us! The llamas are cute, but not as cute as May! They must miss you a lot. I want a t-shirt that says No Lunging on it. That rocks proverbial socks. Great llama photos. I love that sign! You know, I find it completely impossible to resist grabbing the llama and planting a wet one on those lips! Or at least on the nose. No Lunging? Who? The folks who are desperate for fiber? Are they trying to partake directly from the creature? The poor kitties, all that responsibility. I love that there’s a statute for Llama owners. I think Mayhem is really passed out after a long night of partying! Looks like great fun! I love those coasters!! llama llama — duck! no, lunge! love the vacay pics. esp. the prarie dogs…and the kids, uh, cats back home trying SO hard to stay out of trouble. i hope chaos didn’t show may where you hide the feminine hygiene products this time. haw!